A broad ongoing effort is devoted to controlling and coupling physically separate quantum systems, particularly in the solid state. Chains of spin-active defects and spin-photon entanglement are two major routes presently explored to communicate distant NVs. In these architectures, quantum state transport is mediated by the dipolar couplings between the spins in the chain or by spin-encoded photons propagating through a photonic network, respectively. We are presently exploring an alternate approach where spin-polarized charge carriers serve as a bus to transport information between separate NVs. Notably, NVs in diamond are ideal candidates for this type of applications because the set of unpaired electrons forming the NV can be readily polarized by combining optical and microwave pulses. Further, the weak spin orbit coupling of diamond (much lower than in silicon) promises to keep conduction electrons polarized for long times at room temperature. Experimental protocol. (b) NV- fluorescence pattern upon red fixed-point excitation on a previously bleached background. A bright NV- torus is formed as electrons generated at the center diffuse to the sides and get trapped at neutral NVs. (c) Same as in (b) but for green excitation. Here only the right half of the image was initially bleached by the red scan. In all cases, the excitation beam diameter is 1 µm. From Jayakumar et al., submitted. 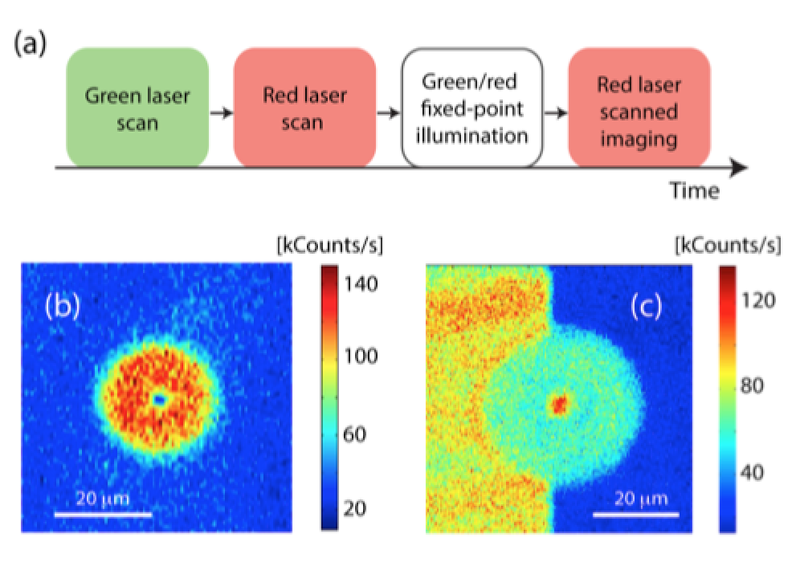 To manipulate the NV charge state we apply light of select wavelength: For example, green laser light cycles the NV charge state from negative to neutral and then back to negative, whereas red illumination only ionizes the NV– but cannot excite the NV0. Initial work aimed at exploring the dynamics of charge transport between NVs is presented in the figure above: In these experiments we use two-color laser light to locally ionize NVs in a region of the crystal and subsequently image the redistribution of charge in the sample vicinity. We observe singular patterns of NV fluorescence resulting from the diffusion and trapping of photo-excited carriers. Selection of the excitation color leads to areas of enhanced or depleted population of negatively charged NVs, depending on the type of carrier excited (electrons or holes), local illumination intensity, and evolution time. Remarkably, these charge patterns remain unchanged for virtually unlimited time periods in the absence of illumination (observations over a week interval show no noticeable change), thus opening the door to 3D optical memories.